In our previous article about the best that a climbing gym could offer, we talked about a number of tools that are strictly related to conditioning for climbing, especially for fingers and arms, but whose use did not imply actual climbing movement. 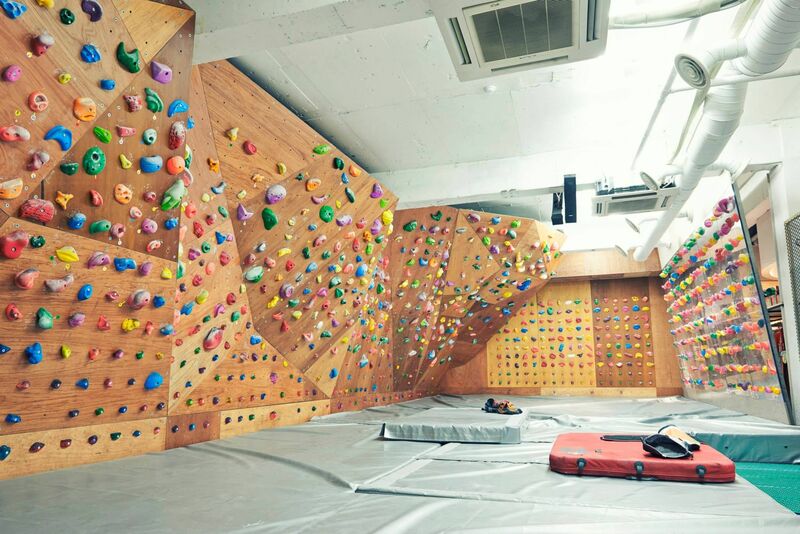 In this article, we will focus on facilities on which proper climbing is possible, but without venturing into the world of full-height climbing walls. This approach leaves us with boulder walls, system walls and other similar structures. The importance of these can hardly be understated. Some people believe that bouldering is all about power and strength and that it disregards technique and endurance. But not only is this a miopic view of bouldering, it is also a poor understanding of what shorter walls can do for you. You shouldn’t be surprised to hear that many top climbers, especially competition climbers (who are required to have insane levels of stamina), train their endurance doing routes and circuits on boulder walls and not on lead walls. Likewise, technique is best learned isolated and this isolation is best achieved on a boulder wall. There, you can try movements several times without boring your belayer to death. Your friends and coaches can also be close to you, showing you exactly what to do. The short boulder wall also relieves you of some of the distractions and additional challenges of wall climbing such as fear of a bad fall, fatigue or the need to free up the route for the next climbers. And although most climbers will of course benefit from spending time doing the thing where it all comes together (whether that is a bolted route in a crag or climbing previously untouched mountain walls using natural protection), it’s undeniable that focusing on a couple of aspects at a time can help a lot. And boulder walls are perfect for this. Unluckily, many of the tools we will discuss in this article are much bigger to set up than those seen in “The Ideal Gym Part 1“. It’s not a case of putting up a Bachar ladder or modding a campus board like in the previous article. Consequently, a couple of the things we suggest can be done more realistically when designing a future climbing wall or during serious restructuring and expansion of an existing one. Just so you know! Pre-set walls are panels of a specific size with specific holds to be mounted according to precise guidelines. Once this is done, a set of instructions specifies a number of boulder problems of various grades that you can practice on. As of 2014, we got to know about two pre-set walls: the famous Moon Board and the more recent Friction Board. This might all look like product placement, but we don’t care. We haven’t seen anything that gets close to a Moon Board when it comes to the quantity and quality of climbing it offers for the space it takes and its cost. If we were to start a gym ourselves, we’d build this first and then everything else. More in detail, a Moon Board is an 8-feet wide and 10-feet tall board (2.44m×3.15m) set at a 40 degree overhang and with a raster of 11 files and 18 rows of holes for plastic holds. Detailed specifications to build it can be found here. Once you are done with it, you can buy a set of holds from the website of its ingenious inventor and late-80s-early-90s top climber Ben Moon. 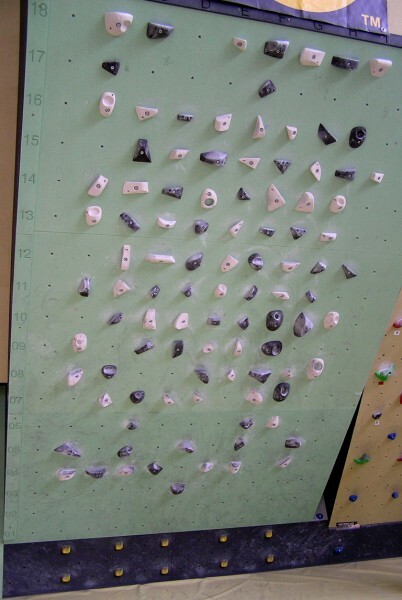 The set is usually 50 holds which, once screwed on the board according to a specific set-up, will create a mini-wall with up to 90 boulder problems graded from 6A to 8A. Yes, you read it right: up to 90 boulder problems consistently graded in the Fontainebleau scale (no more vague, coloured tape grades) from 6A to 8A, traced by experienced setters and evaluated/commented on for quality by users through the Moon website. All this in less than 8 square metres and for just 120GBP/140EUR/200USD/220AUD (plus the cost of building the board structure, but that’s a given in a climbing wall). At that point all you have to do is print out (or save on your tablet or e-reader?) the diagrams that will show you which holds constitute which boulder problem. Finally, you could buy a different set of holds and put it on in a set-up which is meant to use the holes not used by the set you have on already, allowing you to have the boulder problems of both sets plus some extra ones that require some holds from both sets. The Moon Board is basically the Rosetta Stone of boulders and boulder grades. Some even argue that if it had sufficient presence around the world, it would solve some long lasting discrepances regarding outdoor boulder grades or at least help minimise new ones. We personally like to think that it would help boulder setters to give proper grades to the boulders they would then set in other parts of the gym. We also think this knowledge could be applied to indoor routes to make them more bouldery and less continuous (i.e. better training for most outdoor climbing?) while retaining precise grades. Moreover, we love the knowledge sharing this board entails and the fact that it makes quality problems available to anyone in the world. Think of small, growing communities of climbers who simply don’t have experienced route setters: they could easily overcome their problems with this. We have heard people saying that having a Moon Board would preclude them from tracing their own problems, but that’s incorrect. 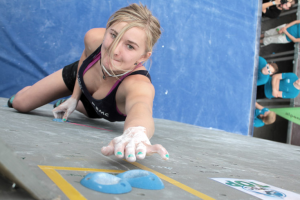 The archive of boulder problems is participative and allows anyone to submit problems on any of the given hold sets and set-ups, with the advantage of having your proposed grade confirmed or changed by other people, who can try the boulder you just penned. 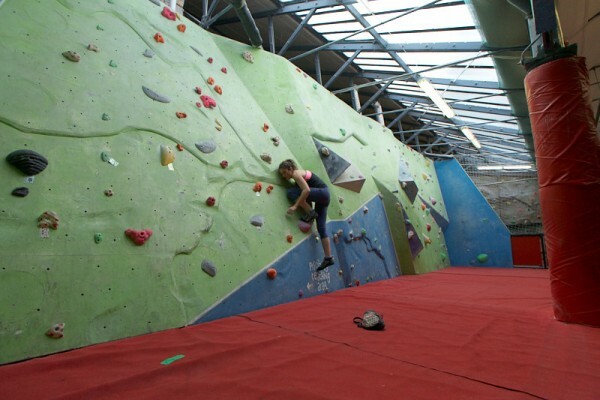 Ultimately, the Moon Board is the best solution we have encountered to offer a training ground for powerful, steep and fingery bouldering requiring body tension and good footwork too. Which is not the only thing a boulder wall should offer, but it is for sure a great place to start from. Have a look at a number of real-life examples here. We haven’t had a chance to test Magnus Midtbø’s Friction Board yet, but we had a careful look at the material available on the net and many of the Moon Board qualities apply to this product too. Compared to Ben Moon’s brainchild, the Friction Board is a younger product and it does not have as many problems yet. But it is a more complex and larger structure (twice the climbing surface) and it comes with 168 holds of all types courtesy of manufacturer So iLL. Consequently, the Friction Board can offer a wide variety of climbing angles and grips. Its problems were devised with the aim of giving the best possible training in as many aspects of climbing as possible. 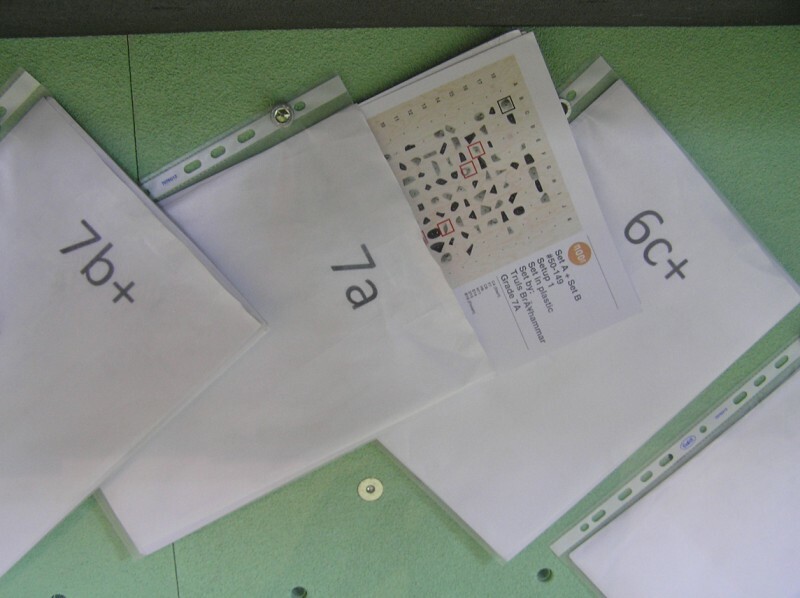 Grades go from 5A to 8A+, making it slightly more accessible for beginners than the Moon Board, and even a few circuits have been prepared, for endurance training. A symmetrical wall is a small climbing surface packed full with holds of all types which, as the name suggests, are placed symmetrically along a vertical line at the centre of the board. This means that any given movement or even combination of movements can be done with perfectly swapped hands and feet, thus giving you the chance to address any imbalances between the two sides of your body, as explained by triple UK Boulder Champion Ned Feehally in this very useful video. 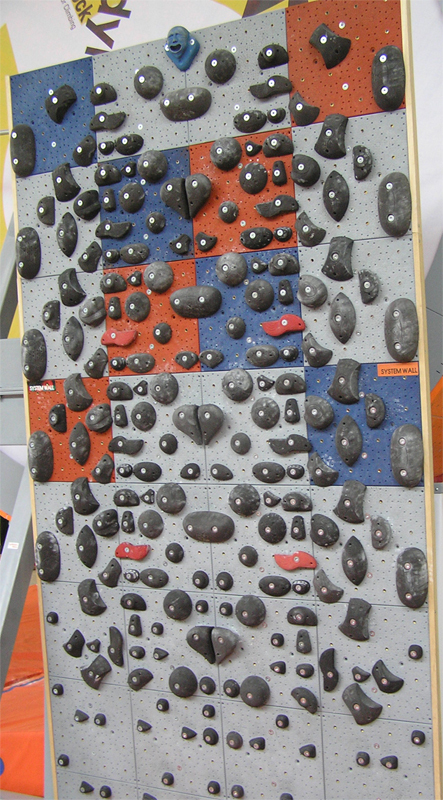 Another characteristic of these boards is the high concentration of holds and the lack of pre-set problems. This forces you to think of your own sequences and to fine tune them by trying to reach for a slightly further hold while pushing on a slightly lower or worse foothold and so on. According to nobody less than Adam Ondra (as per a recent article), striving to trace your own moves on a boulder wall will “make you good at finding your own solutions, visualizing moves, recognizing your own strengths and weaknesses, and most of all, memorizing sequences”. Note that the presence of pre-set boulders in boards such as the abovementioned Moon Board and Friction Board should not deter you from designing of your own boulder problems, a thing which is in fact encouraged by both manufacturers. However, it’s undeniable that a surface with a much higher concentration (and variety) of holds will allow you to be more creative, while the symmetrical structure of a board such as the one used by Ned Feehally will allow you to have a more thorough approach. What we have seen at times but we didn’t find particularly useful are boards lacking both pre-set problems and a symmetrical structure. These are steep boards on which a number of small and fingery holds have been put in a random fashion on every single bolt-hole. This set-up still allows for a number of different moves to be performed on a relatively small surface (so it’s still an efficient use of the climbing surface of your gym), but it lacks the “thinking” that goes behind setting up a symmetical board or one with pre-set problems. They offer nothing that the other types of boards seen so far offer too, but they don’t have anything of their own either. Below is a good video showing the variety and the completeness of exercises a good symmetric board can offer. Note how a moderate angle for the wall allows to train footwork too, with drills working on moves such as heelhooks on flat holds. Finally, the Power Company Climbing blog has a few posts with loads of practical suggestions on how to build good symmetrical boards. No excuses for not having one, now! 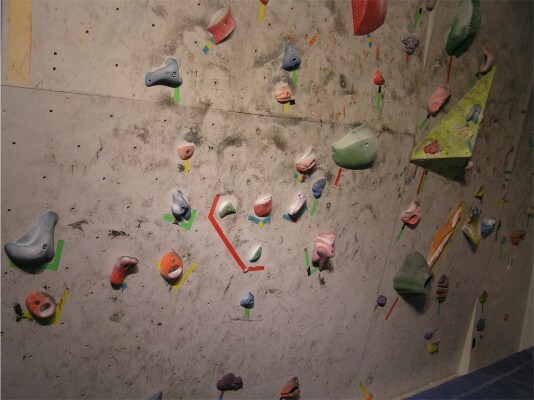 Many of the tools in this article are specific solutions that can occupy just a little of the surface of your boulder wall or, in general, little space of your climbing gym. The bulk of ropeless climbing, so to speak, should come from tens and tens of problems set on the rest of the boulder walls you have available. This task can be accomplished in two different ways. The first one is to set boulder problems that are relatively isolated and distinguishable from each other, mostly because the holds of each problem are all of the same colours, like routes on a lead wall. The other is to fill the wall with holds of any type/colour and then use coloured tape to mark the holds that belong to one specific problem. Both methods have advantages and disadvantages and the best solution would be to have a mix of both approaches according to a number of deciding factors, such as the size of the gym, the levels of attendance and the ease with which setting can take place. “Low density boulder walls” (for lack of a better term) look nice. You can just walk to the wall and see what the problems are like, where on the wall they end up, what type of holds they have. You don’t quite have to look for the holds as you climb, you can always tell what’s the next hold to grab, unless they are heavily covered in chalk. And if you ever decide to have a competition, it is easier for the audience to see what the climbers have to work on, which is one of the reasons why this is the way they are set in official IFSC events. However, this approach is somehow wasteful of space, which is critical if the gym is small but has loads of climbers. 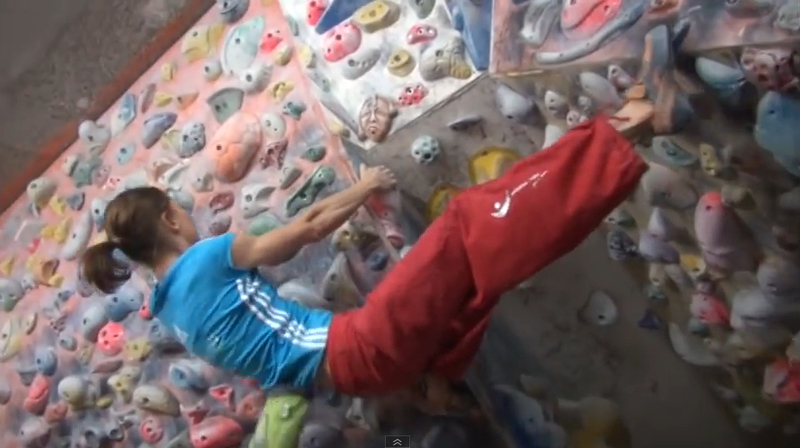 Given a certain surface, having nicely spaced out boulder problems won’t keep as many climbers busy for as long. The 8 square metres of a Moon Board that can host some 176 problems couldn’t probably host more than 4 or 5 boulder problems set this way. Plus the actually density of holds is not high enough to allow you to tweak in movements that are really at your limit of reach and power. A “busier” boulder wall might be baffling to those used to the other type. Especially for beginners, it could be a bit boring or even downright frustrating to memorise the various holds marked by the tape rather than just climb up following the holds of the same colour. Which, if you think about it, is the way wall routes are set, so why can’t boulders be the same? And if you have to free up the wall for a competition, sure you have much more undrilling to do in order to have a clean wall on which set the comp problems. 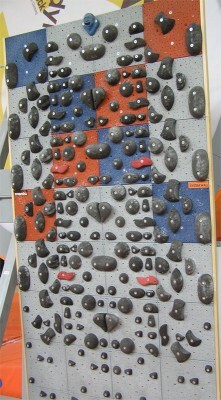 This said, there are many advantages to a wall full of holds. You can create your own problems more easily or deviate from one made by the setter more easily because you’ll always have something near to choose in order to make things a tad harder (or easier) for you. If your gym is not big, it is the most efficient use of space because you’ll have more problems per square metre of climbable surface. Plus re-setting, for those who really want their challenge to be set by others, can happen more quickly by just readjusting the tape markers. Often incorrectly ignored, slab boulders can be an amazingly fun complement to all the steep bouldering a gym offers. They will of course focus on balance and footwork and should not become a place for übercrimpy but overall obvious problems. Slab boulder can be especially important to help beginners who started indoors gain the repertory of movements typical of the routes they are likely to face outdoors when climbing at the low grades.